Attessa IV - Diana Yacht Design B.V. The complete refit of Attessa IV (ex-Evergreen) has been worth the work. 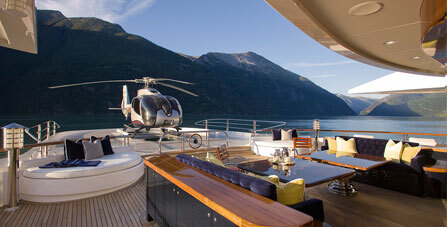 This beautiful superyacht is nominated for a World Superyacht Award 2011 in the category Best Rebuilt Yacht. She stretches 92.14 meters from bow to stern with a displacement of 2,621 tons. Beneath her exquisitely beautiful finish she has a steel hull and her higher decks are aluminium. Attessa IV displays a sleek, elegant profile in the water, distinguished by a rounded bow, broad beam aft, and upper decks towards the centre. Her interior appointments can only be described as impeccable, from the majestic grand saloon to the large recreation facility with its large karaoke bar and full dance floor, to the magnificent master stateroom, 14 luxury guest cabins, and spacious crew quarters. 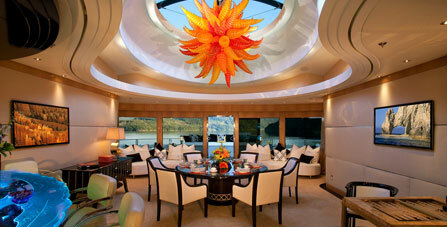 The comprehensive appointments of crew quarters alone far outstrip those of other yachts. The complete refit of Attessa IV has been worth the work. 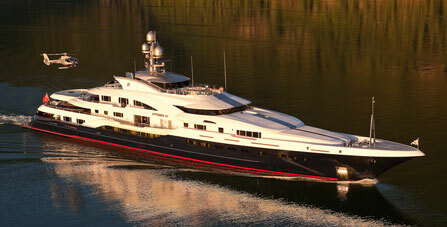 This beautiful superyacht is nominated for a World Superyacht Award 2011 in the category Best Rebuilt Yacht. She stretches 92.14 meters from bow to stern with a displacement of 2,621 tons. Beneath her exquisitely beautiful finish she has a steel hull and her higher decks are aluminium.